Anton Morozov is one of a few surfers on the wild shore of Kamchatka, Russia. 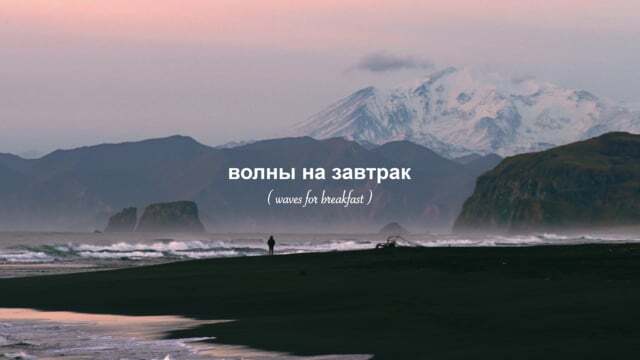 Kamchatka is a peninsula and the most eastern part of russia, a place where real and raw nature still exists. Anton lives here in his trailer just next to the ocean where he decided to open a surf school 11 years ago. Today he is a local legend and we met him for a cup of hot tea and some waves. For Anton it was a mild morning around 3° celsius so he was happy to surf without gloves and hat. It was late September and the volcanoes surrounding the bay were already covered in snow. After a group of sea lions appeared next to us in the water, we knew what he was talking about. We visited Kamchatka in autumn 2017. As we heard about Anton we had to visit him in his surf school for a quick surf session. Unfortunately we only had 4 hours before we went to the airport to catch our flight back to Europe.